The TDA4821P performs the ,autosize, feature for colour monitors. The IC measures the Timing of active H/V Video with respect to the H-sync and V-sync pulses and also with respect to the horizontal flyback pulse in order to allow the Microcontroller to adjust the Display settings automatically, in particular parameters HSIZE, VSIZE, HPOS and VPOS.The advantages are:A more user friendly adjustment for any undefined Video mode by simply pressing a buttonFactory alignment for a reduced number of modesSaving of EEPROM storage space for factory and user modes.The activation of the autosizing function CAN be done on user command or automatically on any mode change. When autosizing is activated while the screen is only partly active or consists of sub-windows, the picture size will increase, but not more than the range limits of the monitor allow. This is one package pinout of TDA4821P,If you need more pinouts please download TDA4821P's pdf datasheet. 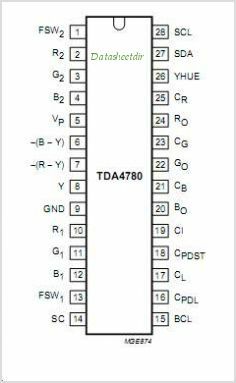 TDA4821P circuits will be updated soon..., now you can download the pdf datasheet to check the circuits!